Cantilever Racks is specially designed to store long or varying length items, such as metal beams, pipes, moulding, wooden boards, metal and plastic sheets among other materials. The system basically consists of columns with a vertical beam and one or two horizontal beams at the base to provide stability. A series of arms is attached on which the load is placed. Loads may be handled manually when they are light weight, or by using lift-trucks or other appropriate lifting systems when heavy items are involved. long goods, an optimised storage systems can be provided. 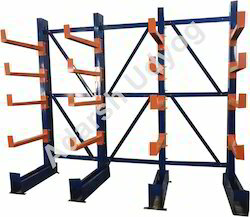 Cantilever Rack is specially designed to store long or varying length items, such as metal beams, pipes, moulding, wooden boards, metal and plastic sheets among other materials. The system basically consists of columns with a vertical beam and one or two horizontal beams at the base to provide stability. A series of arms is attached on which the load is placed. Loads may be handled manually when they are light weight, or by using lift-trucks or other appropriate lifting systems when heavy items are involved. long goods, an optimized storage systems can be provided. 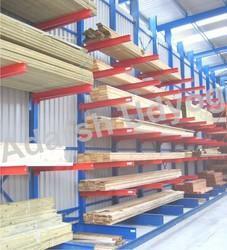 Looking for Cantilever Rack ?